The Brompton M6R Folding Bike is the Original Folding Bike, using Brompton's M type handlebar, the M Type is Brompton's first and original handlebar and 6 gears using the Brompton Wide Range hub gear, (BWR) which is made exclusively for Brompton by Sturmey Archer. With the practicality of 6 gears at your beck and call, any rider can travel greater distances on their commute or weekend adventure without the worry of running out of gears. The M6R comes equipped with Brompton mudguards, rack & pump meaning you are equipped for every eventuality on your commute. 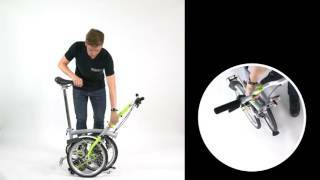 Brompton's are as simple and user friendly as they come, using their patented folding mechanism, no folding bike can fold as fast and as compact as a Brompton can.